Playa El Tunco Is the most popular beach destination par excellence! Its tranquility during the week and its nightlife during the weekends have developed a youthful atmosphere where the art of music and dance shows its greatest expression. A variety of hotels for all kind of budgets offer services for both backpackers and guests in need of maximum comfort​. Suites - apartments with three beds, refrigerator, private bathroom, cable TV, swimming pool. 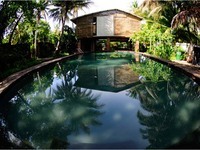 Simple rooms with shared bathroom, wooden suite with sea view, swimming pool, large gardens and rooms. Rooms in front of the beach with air conditioning, private bathroom and fan, pool and internet. ​The Pacific coast of El Salvador is really impressive from several angles, and is perfect for taking unique photographs from this paradise. La Libertad is located only 30 minutes away from San Salvador, the capital city of the country. After receiving a cordial invitation to enjoy a boat adventure on a sunny day in a November morning, we traveled to La Libertad, specifically to Playa El Tunco and Playa El Sunzal The conditions in November are perfect and safe to embark from the beaches of La Libertad. Low tides, small waves and calm waters offer the perfect conditions to enjoy the experience. Here is a small compilation of some landscapes taken from inside the ocean, nearby popular destinations such as Playa El Tunco, Playa El Sunzal, Playa San Diego, among others, all in La Libertad area.